Oakwell Stadium will host a meeting between Barnsley and Shrewsbury Town on Friday afternoon at 3pm in League 1. The hosts are currently placed second on the league standings after forty-two games played, five points behind league leaders Luton Town, while the visitors occupy thirteenth spot, six points clear of the relegation zone and three points behind twelfth placed Oxford United. When the two last met, it was Shrewsbury who came out on top in a 3-1 victory. Barnsley come into this one having lost just once in their last five outings, winning twice and drawing once during that time. Following a goalless stalemate away to Doncaster Rovers in mid-March, Barnsley then took maximum points from their trip to Walsall thanks to a late Jacob Brown strike, with the midfielder grabbing the solitary goal of the day. One week later, Coventry City made their way to Oakwell and earned a point from the affair in a game which saw both sides take the lead once during the ninety minutes, and Daniel Stendel’s men subsequently visited Burton Albion in their opening encounter of April, losing 3-1. 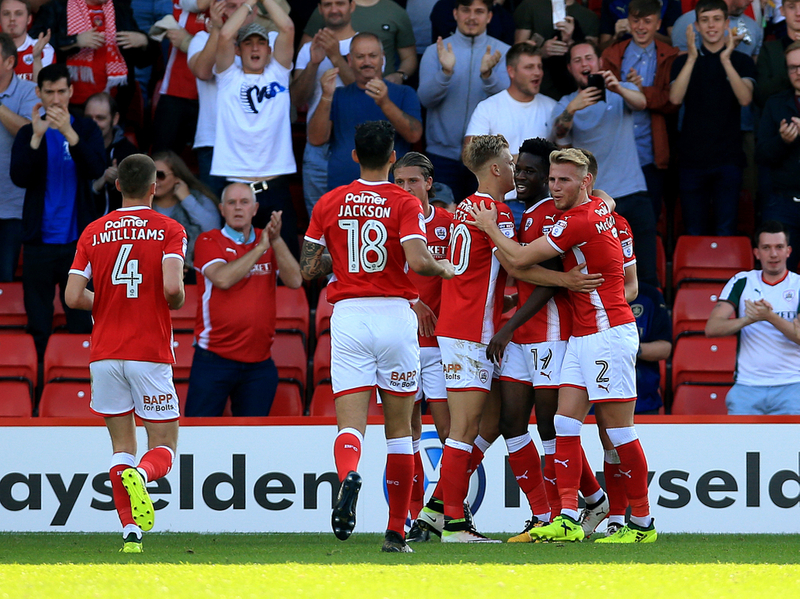 Barnsley’s most recent fixture came as a victory by four goals to two on home soil versus Fleetwood Town. Kieffer Moore has netted a total of sixteen goals up to now and that record puts him top of the goal-scoring charts at the club with three more than Cauley Woodrow. Moore has bagged either a goal or an assist in each of his last six appearances, five of which have come as goals for himself. Woodrow has also enjoyed a good spell of form over the last few weeks, finding the back of the net in his last three matches. In terms of assists, Alex Mowatt can boast the most on seven, two clear of teammates Jacob Brown and Mamadou Khady Thiam who are joint behind him. Shrewsbury Town’s form has been similar to that of their upcoming opponents’, losing once, winning three and drawing on one occasion, keeping two clean sheets during that time. Succeeding the victory over Wycombe Wanderers by two goals to one, Portsmouth then journeyed to Montgomery Waters Meadow and earned all three points in a relatively comfortable 0-2 win. In their last outing of March, Shrewsbury scored the only two goals of the game away to Southend United through Fejiri Okenabirhie and Luke Waterfall. Shrewsbury’s opening match of the penultimate month of the campaign came at home to Scunthorpe United, where both teams hit the net once, although each of the two goals was scored by Scunthorpe players as Adam Hammill netted an own goal six minutes from time. In their most immediate game, Shrewsbury Town defeated Gillingham by two goals to nil. Okenabirhie leads the scoring charts at Shrewsbury with nine goals on the board thus far, one ahead of Oliver Norburn and three more than what Greg Docherty has bagged up to now. The 23-year-old Nigerian has found the net just once in his last five games, while Norburn has gotten on the scoresheet twice in his past six appearances. Docherty has been the main provider of assists and has totalled fourteen goal involvements as of now after supplying eight goals for teammates over the course of this campaign. Shaun Whalley is his nearest competitor or top spot with four assists for himself.